Seen from this angle, this question surely gives rise to smile, and even if it had an answer, the Ancients would not have cared at all. However, such a being was considered in ancient times as a monster, whose appearance was a divine punishment, and his fate was therefore not enviable at all. In Rome, the law allowed to kill newborns having deformities (it remained to be seen what kind of "deformities" were acceptable or not, which gave rise to much argument). Cicero even declared that such a practice was a duty. Seneca recommended the elimination of hermaphrodites by drowning: it was thus unacceptable to be physically male and female at the same time. Though, this concerns only the physical conformation: the bisexual behavior, for its part, did not shock neither the Greeks, nor the Romans. Little is known about how women's behavior was judged in this regard, but they both set limits: an adult man should not behave "like a woman" (considering that the man was "active" and the woman "passive"). In Athens, teenagers were treated like women, and could therefore "submit" to an adult. That was even seen as positive, like a privileged relationship between the pupil and the master. However, as an adult, he had to "behave like a man". In 1880, in Egypt, the Abdel-Rasoul family used to make money by plundering the tombs of Thebes and selling items to ancient dealers and Europeans. 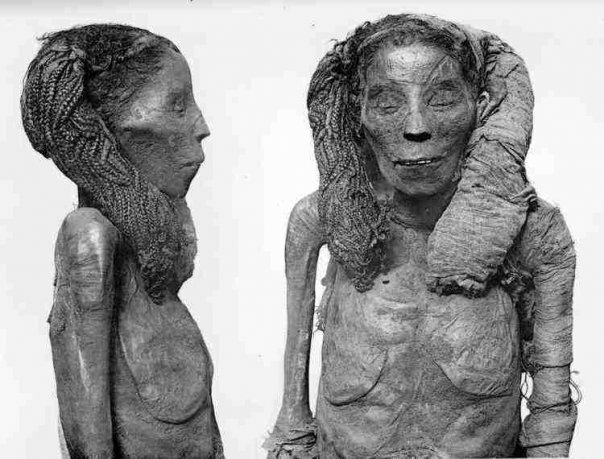 This family had discovered the cache of Deir Al-Bahari, where many royal mummies were stacked. Gaston Maspero, a Frenchman who was in charge of Egyptian antiquities at that time, went to Luxor in order to investigate the strange appearance of precious objects on the market..
Queen Ahmose Nefertari Finally, with the help of the police, he extracted a confession from a member of the family. 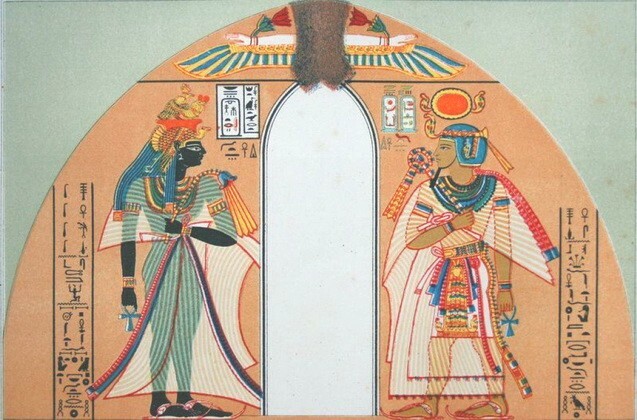 such as Tuthmosis III, Ramses II, Amenophis I, Ahmose, and his wife Queen Ahmose-Nefertari, a prominent political figure from the beginning of the 18th dynasty, and among the most revered by the people. Those precious relics had to be moved urgently to Cairo in order to keep them safe. since any goods entering Cairo were subject to a tax. - Uh ... what's that? - bodies of ancient deceased. - Ah, corpses. Do you have their burial permit ? Well, that was not the way to make any progress. It was easier to view the mummies as objects. Perplexity. How to tax them? The official consulted his classification: no heading "mummies". Lastly, he decided that the nearest item in his nomenclature was... salted fish. Gaston Maspero had to pay customs duties according to this scale. Don't you think it's rather unrespectful to treat the great queen Ahmose-Nefertari as if it were salted cod? Everyone knows the game "rock-paper-scissors" which has the advantage of requiring no accessories, neither screen nor batteries..
Did you know that this game was brought from Asia during the 19th century, and that its origin is Chinese? According to the writer Zie Zhaozhi, it was known since the Han dynasty (206 BC to 220 AD). And yet some people call it Jon Ken Pon, its japanese name, and “roshambo” in the USA. In France it's also known as Chifoumi, which means "one-two-three" in japanese (HItotsu FUtatsu MIttsu when counting items). But let us come back to the topic. In Corsica and all the south of France, in Languedoc as in Provence, people play a more complicated game called Mourre and in Italy Morra. Each of the two players flap the fingers of one hand and, when signal is given, shows as much fingers as he wants. At the same time, each one calls out a number that will be, in his opinion, the total number of fingers displayed (his plus the opponent's). If no one told the right number, they start again. The one who announces first an exact number wins the round (the number of rounds has been defined previously). Apulian crater,ca 420 BC. 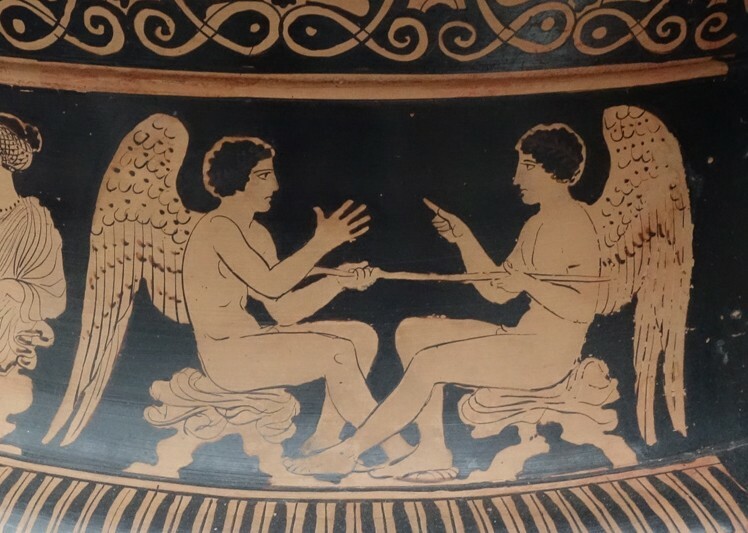 (photo V.Dasen) Well, this game already existed in ancient Greece (it was called Kleros dia daktilon, Kleros dia daktilon, which means "draw lots with the fingers") as well as in Rome (micare digitis, “waving the fingers”). The goal was slightly different because in ancient times, drawing lots was not a matter of chance, it meant relying on the gods. This is close to divination, since the gods express their will by designating the winner. Among the Romans, players were usually adult men and the goal of the game was often to make a decision. Today, we could flip heads or tails. 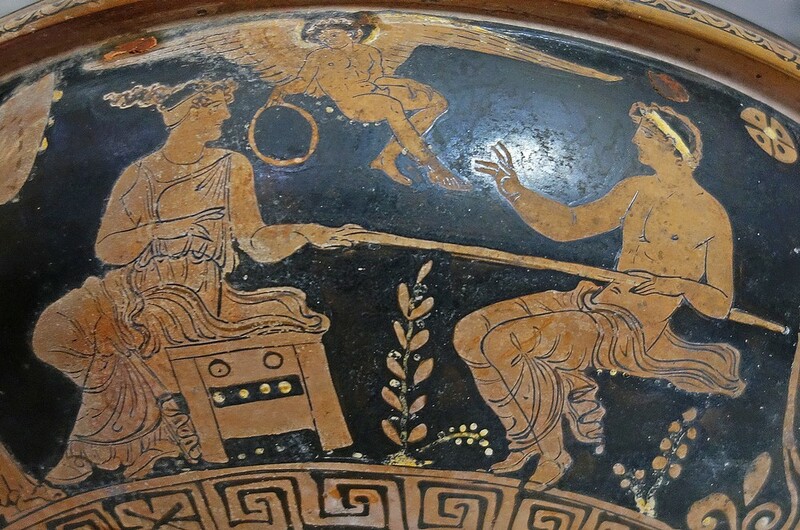 In Greece, this game is represented on vases as early as the mid-5th century BC but the players were usually young people. Among the players, we may see sometimes some divinity like Aphrodite or Eros, sometimes a satyr. Players often held a stick with their left hand while playing, perhaps in order to count points. What were the stakes? Considering the characters depicted, love was certainly present. Who will get a fortunate fate ? And what about playing Kottabos? In ancient Greece, taking part in a banquet denotes the belonging to the aristocratic class. The first part of the banquet was devoted to solid foods. The tables were then cleared, and with the second part of the party - the symposium - came the moment of drinking. Would this entertainment seem scandalous today? Other places, other mores! 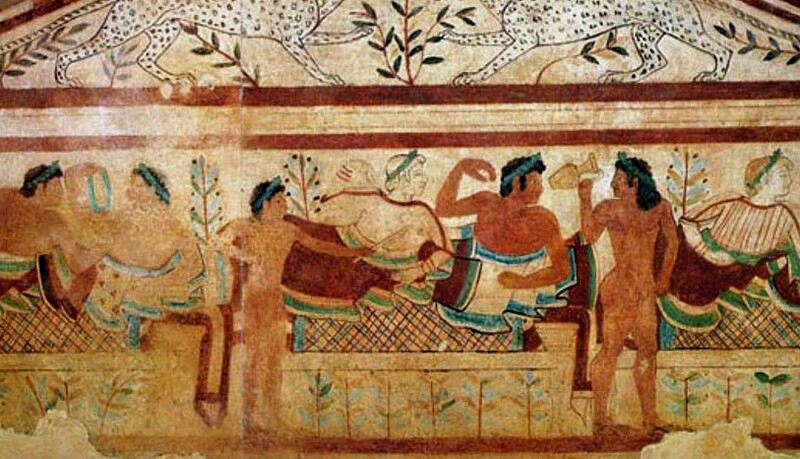 The Greeks, like the Romans, were scandalized when they saw that Etruscans dared to invite their wives to banquets. Admittedly, Etruscan wifes were much freer in all respects than Greek and Roman women, and were not known as being shy.